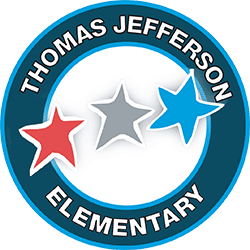 Thomas Jefferson Elementary is a very special school and our entire staff is honored to serve the neighborhood community by providing transitional kindergarten through fifth-grade education that is grounded in quality first instruction. Since the school’s opening in 2004, our staff has strived to be innovative and trendsetters with our teaching, which has earned our recognition as a California Distinguished School. Our school is committed to the individual needs of our students. We are dedicated to improving student performance, teacher instruction and the enhancement of knowledge and skills required for working, living and learning in our ever-changing society. Our students participate in a range of programs including art, music, physical education, media, social-emotional learning, and technology. Each day our students are taught to model character, integrity, and maturity through our positive behavior programs as they strive to grow into productive citizens. Thomas Jefferson is a great place to be and our students RISE to success! We are committed to creating an maintaining a nurturing, emotionally and physically safe learning environment. We are committed to collaborating with our peers to improve our practice. We are committed to utilizing data to improve instruction and student achievement. We are committed to sustaining collaborative relationships amongst stakeholders to achieve common goals. Every student learns at high levels every day; in an educational community that believes in creating life-long learners and problem-solvers.